The TETRAD Eastwood range as shown on this page is available to view in our showrooms. 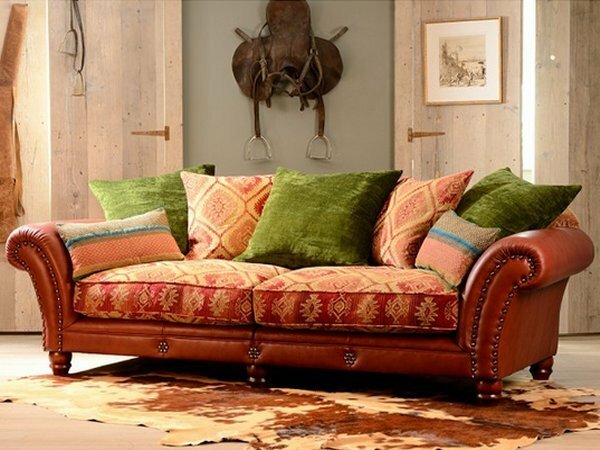 The original Tetrad Eastwood sofa as shown below is a stylish combination of antiqued water buffalo hide, kilim chenille seat cushions and soft tactile scatter cushions. Its solid, hand-polished chestnut wood turned legs and individually studded facings also add a touch of glamour - our favourite mixed leather and fabric sofa, in fact our favourite Tetrad sofa! As featured in the "Tetrad Heritage - Coming Home Catalogue". See below for more images of the Tetrad Eastwood sofa, chair and Ottoman footstools. Should you wish to visit us in person, we have a fabulous selection from the current Tetrad range on display in our showrooms in sunny Southport. Directions and map. Probably the most complete and comprehensive display of Tetrad furniture available to view in the UK. You're always welcome to come and try, sit, talk fabrics, talk Tetrad! FREE delivery on all TETRAD furniture orders to UK mainland addresses at Harvest Moon! We can also deliver new Tetrad sofas and chairs anywhere in Europe by dedicated carrier please ask for a quote. The image above shows the Eastwood sofa shown displayed in Buffalo Oxblood hide with Kilim Salmon fabric. Only available as seen. 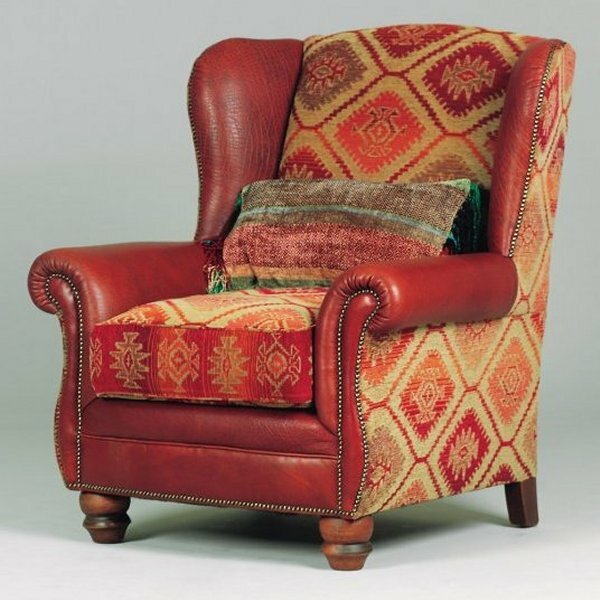 Luxurious wing chair will either perfectly enhance the Eastwood sofa or happily stand alone. 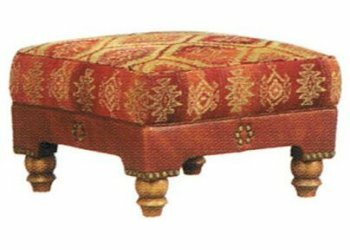 Tetrad Eastwood ottoman footstools shown below offer an extra touch of comfort and versatility. 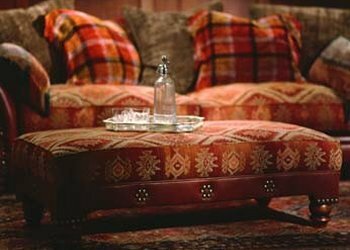 Choice of rectangular or square Ottoman footstools. We also supply replacement fabric seat covers and scatter cushions for the Eastwood range. New Tetrad seat inners for your Tetrad Eastwood sofa are also available, which are now a feather fill inner with a foam core in the centre that gives a nice soft feel but doesn't need quite as much plumping.